If you really want to get a true grasp and deep understanding of music theory for the most practical applications such as; not only playing/performance but also production and engineering, composition, teaching and exam/study situations, well then it may be best for you to look at it from the ground up as they say. The word "pitch" is a common subject of discussion in and around music theory. If you start from the true beginning we want to first make sure we understand the concept of pitch and pitch direction. So if you tap a pencil on a tabletop the impact displaces air. This creates a wave of compressing and ‘un-compressing’ air travelling across the room (by compression and rarefaction) until it dissipates or is absorbed by something. Think of the old children’s “slinky” toy spring. Another analogy is the “wave” you could make in a channeled line of ping-pong balls as one bumps into the other with a quick dink of a finger or flick of the wrist. Like sound pressure waves, these are longitudinal waves. Both longitudinal and transverse waves are what we are concerned with in music theory. For now let's stick with longitudinal. (ok if you must... think of the ping pong thing or a car bumps a car in front who bumps the car in front [where no one is hurt or sues] as longitudinal. Transverse is more like the wave two kids get with a jump rope undulating in a moving S shape from the up and down movement up their arms at opposite ends, (hmm, kind of like a vibrating guitar string...) One is parallel movement the other perpendicular movement from the energy source. Right that's enough. have another tea break. Now think of it this way, if you were to tap a pencil on a tabletop fast enough that initial “one off ” transient tap sound would eventually (if it were possible to tap it fast enough) turn into a sustained pitch. This would begin to happen at about twenty or more taps per second. This is how frequently you need to tap the table with the pencil for it to turn into a sustained pitch. You may have put a playing or trading card against the spokes of a spinning bicycle wheel as a kid or even the blades a fan of some sort (not recommended boys and girls!). If you did do so you may have noticed a rough but discernable pitch emerging through the racket. So anyway the twenty taps per second is the frequency. This is expressed, as 20Hz. Hz is an abbreviation for Hertz. Heinrich Hertz was a pioneering physicist for whom the unit of measure of one complete cycle of vibration per second in frequency is named. If you could keep tapping faster and faster you would travel through the spectrum of human ability to perceive pitch and eventually reach about 20,000 (twenty thousand) taps per second (20kHz or 20 kilohertz) where the movement of air pressure is basically too small to be transferred to your brain. 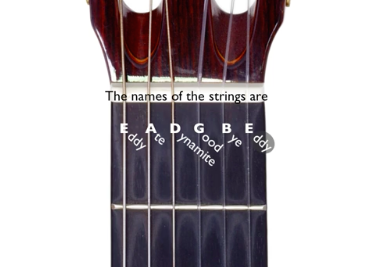 Along the way at 440Hz (440 taps per second) you would hear the sound of the pitch “A” that is the same pitch created by the first string “E” of a guitar with your finger on the fifth fret. This is often a standard reference for tuning in orchestral settings. So again the science of sound relates back to our music theory. In Music Theory Which way is Up and Down? So we label our perceptions of pitch by frequency. The higher the rate of frequency the higher we say the pitch is. At the very least this is the likely reason why by convention over time we have come to say “lower” or “deeper” for lower (slower vibration) frequencies and words like “higher” or “rising” and so forth for higher (faster vibration) frequencies. So then, in everyday life situations we would consider something like bird song as a high-pitched event. Likewise we perceive the rumble of thunder to be a low-pitched sound. This convention of perception is a basic natural understanding of music theory concepts. With a little logical thought we can transfer this idea directly to musical instruments. Lets look at the ubiquitous keyboard. Take the piano, when it’s farthest key to the left (the note A) is depressed, a felted wooden “hammer” mechanism strikes a two meter long string that produces a vibrating frequency along its length of 27.50 Hz. This is pretty muddy and not much above the threshold of hearing perceptible pitch. As you strike each key to the right another hammer strikes a shorter string or set of strings that is tuned to higher and higher pitches. Eventually, eighty-eight keys later, you get to the far right key that reaches the heady heights of 4.186khz (the highest C). There is another thing to consider here that warrants a music theory discussion of its own and that is Timbre, …the character or quality of a musical sound or voice as distinct from its pitch and intensity. (The Oxford English Dictionary). What this means is that there are various other factors that create and include a recipe mix of vibrations other than just the fundamental frequency rate for any individual sound source. This in turn gives us the type of tonal characteristics that allows us to recognise the source of the sound, such as in the case of the pitch “A 440Hz” as say, a voice or a whistle or a violin or even the first string of your guitar at the fifth fret! They are doing the same thing in their own way. They are vibrating because of one reason or another and generating air pressure differences. It does not matter if it’s vocal chords, guitar strings, or bars of metal or columns of air in big brass tubes. The timbre will identify the source; the frequency will identify the pitch. One little detail worth bringing up at this point is that if you count the inclusive letters in the musical alphabet you get seven; ABCDEFG. If you count the inclusive letters when you return to the letter you started on you get eight: ABCDEFGA. This is referred to as an octave. Like “oct” anything it is the prefix meaning “eight”. Like octagon or octogenarian. What’s mathematically important here in music theory is that each octave is double the frequency of the one before it and half the frequency of the one after it. …and so forth. The chance occurrence that the pitch A is a simple repeating number pattern without lots of decimals to worry about could be why it is used commonly as a tuning reference. Although we have identified the octave as seven notes plus a repeated first note there is still two more ideas to consider. The 12 tone equal temperament and cent-tones. If you look at any piano or keyboard instrument (the "mother ship" instrument of music theory) you can see that it follows a repeated pattern. There is always a group of two black keys then a group of three black keys that can be visually located. To the left of any group of two black keys is the note C. From here you can calculate and name all the other white keys by simply filling in the alphabet. The white keys are called the natural notes and the black keys in between are called the sharps and/or flats. All together the western system of music theory has a total of twelve notes. This is when we include the sharps and flats which are the black keys on the piano keyboard. Collectively the sharps, flats and naturals can be called or used as “accidentals”. All notes have more than one name. For the most part a sharp raises a note and a flat lowers a note by one half step, also called a semitone, which is from one key to the next adjacent key regardless of colour. If you count the notes also called tones from C to C including the black keys you get 12 (keys, pitches, notes or tones). This half step/semi tone interval is divided into 100 cents. Twelve hundred (1200) cents will make twelve equal 100 cents parts to the octave. N.B. The cent which is 1/1200th of an octave is not the same as the centitone or Iring (named after Widogast Iring) which is 1/600th of an octave. Most of todays music technology dealing with fine tuning uses cents as the unit of measurement. As guitar players where this really affects us is in our tuning and fine-tuning while playing. The most common occasion for needing to be aware of all of this math and science is when you need to tune to a recording or for a live ensemble performance down a half step or to a non 440hz pitch reference. Most reasonable quality tuning aids will have calibration controls for setting tuning reference standards. Most will also have gradations in cents. Either with reference controls or visual gradation in cents you should quite comfortably tune or set up your guitar to “slack key” down tuning by a half step or other variations from the 440hz standard. If you are referring to gradation marks in cents it is important to realize that 100 cents is a half step, or semitone. Sometimes you may have to tune to an old recording where you set up your reference say at a quarter tone (or 50 cent difference) away from 440hz concert pitch reference by ear and then use the tuning aid device to make life easier for a band, recording performance, educational setting and so on. Another reason to be aware of this kind of music theory detail is in preparing for performance using familiar idiosyncratic instruments. For example my favourite guitar for several styles of electric playing “likes” to have the open G string tuned slightly flat so that the striking of that string at the gauge I prefer to use on this guitar excites in vibration up to the true 196hz of G concert standard. Then also the A 2nd fret note is at true 220hz when stopped over the fret. If I’m recording a gentle quiet passage using a lot of open G sound I may tweak that back up a bit just for that take. This is called “tuning to the attack”. If you plan to do a lot of heavy low tunings in your playing and writing then string gauge and tuning to the attack become a consideration. Different mammals and other living creatures have varying ranges of pitch perception. For instance dogs can hear a much higher pitch range of perceptible frequency. I think I read once that snails can hear a pitch that is (slower) lower than 20Hz. I must admit I don’t know how that works. To us humans it would just start to sound like clicks or some kind of transient series of single events. How do you ask a snail a music theory question about what he/she is hearing anyhow?